As you might have read on SamMobile Samsung announced the Galaxy Tab 3 7.0. Today SamMobile received the first picture of the Galaxy Tab 3 8.0. The tablet looks the same, only the bezel is thinner and the Tab 3 8.0 has more level sensors. 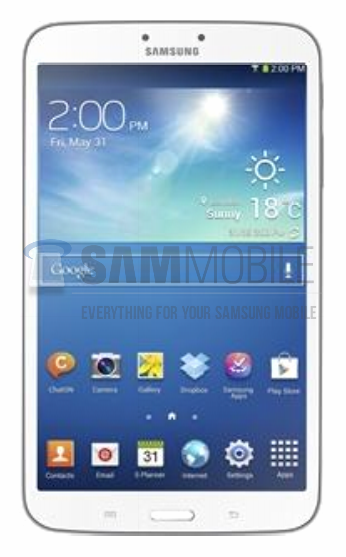 The Galaxy Tab 3 8.0 is by Samsung from is expected end next month! You can view the picture and specifications below. SamMobile will add the tablet to our compare page later today! Reminder since the tablet isn’t official announced yet the specs could be changed! I was really hoping to retire my Kindle Fire 8.9 (despite the freakishly wonderful display resolution) along with my Galaxy Tab 8.9 so I could consolidate on a single device in the Galaxy Tab 3. Very disappointed in the resolution and that stupid button on the front. I want a landscape tablet, not a big S4 or Note 2. The smaller bezels will make it more difficult to hold in landscape mold when holding it with one hand. My thumb touches the screen a bit on my 7.7. So with the smaller bezel, my thumb would be on the screen and accidently touching the screeen. What? No LTE? Hate it. Galaxy Tab 7.7 is the best in this category so far, even when it’s release 2011. I don’t understand why samsung can’t make an AMOLED display tablets with metal body like this mode ?? is it so hard to recreate again? and why to follow it up with useless tablets with almost same specs ?!! I also have my Tab7.7 since june 2012 and there is still NOTHING better. Looks like Samsung is now targeting low cost market with these 7 and 8″ devices and on the other hand offering the Note8 for the ones, who have more cash. But not even Note8 is an alternative to Tab7.7. Let’s see next iPad mini! Looks like the Galaxy Mega 5.8 inch?